If you have any questions regarding membership, we will be happy to answer them. When you join our organization all you pay for is the Individual Yearly Membership Dues. Dojo membership is for Dojo owners only, but must also become a individual member. We make no requirements as to how many members your Dojo has to have to become a Dojo member, but all of your students must become members of Okinawa Matsusokan Karate to be eligible for promotion from Okinawa Or the association. All membership dues, are Due every January of the new year. Except when a new student enrolls after JANUARY then fee is due at time of school enrollment, fee is not prorated. Black belt certificates Sho-dan thru Ku-dan (Master Instructor - Sensei) come from Okinawa THROUGH recommendation by sENSEI Roemer, you may request to take a promotion examination with Sensei Roemer, the Regional Director or through your Sensei. ​If you do not have a Sensei but practice on your own you may apply for promotion examination through sensei Roemer either at his location or through Video. For members of Dan rank you may also go to Okinawa to train with Sensei or take a promotion examination. Your membership must be continues and in good standing. Promotion fees are paid in advance you pay for thru the association. 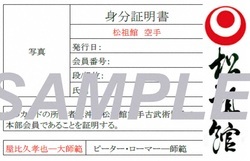 The Kyu certificates are issued by you and we do not ask you to purchase them from us (unless you wish to), or ask for any money from you for the Kyu ranks. All your students from the Dojo are required to join starting at the age of 12, under the age of twelve you are not required to join. The Individual membership includes a Photo ID Card, and DOWNLOADABLE training manual with all belt requirements up to Sho-dan for Okinawa Matsusokan Karate. 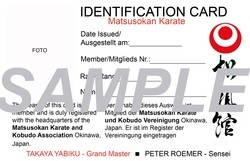 Dojo membership will include Dojo's Sensei ID card, and a Dojo membership Certificate From Okinawa. The membership must be renewed yearly every January. There is also a virtual Dojo for members to learn or review their Kata and Bunkai. Werden Sie Mitglied von Okinawa Matsusokan Karate EUROPA. Please inquire about yearly Dues and Dojo membership. Postage fees will be added to total membership fees, depending on location. Dojo Certificate and Individual member ship cards are issued only once, in order to keep them valid you must renew your membership each year. 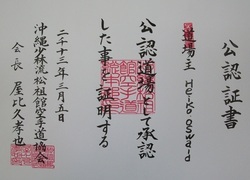 The certificates are all hand made by a Sensei in Okinawa who specializes in writing Kanji. They are not mass printed as it is common with a lot of organizations.